Is Morbid Obesity Surgery Safe in Cirrhotics? INTRODUCTION: Although bariatric surgery has proven to be a safe and efficacious modality before and after kidney transplantation, the data on the effect of bariatric surgery in cirrhotics are not as robust. We sought to determine whether bariatric surgery in cirrhotics was safe to perform since appropriate weight loss has the potential to help improve transplant outcomes. METHODS: An extensive literature search was performed using MD Consult, Cochrane, Ovid, and Medline using keywords “cirrhosis,” “bariatric,” and “obesity surgery.” Demographic information, type of bariatric surgery, and surgical outcome were recorded. RESULTS: 3 articles were found with a combined total of 44 cirrhotics who underwent bariatric surgery. The mean age at the time of surgery was 49.5 years. The average BMI before surgery was 52.5. 27 patients underwent laparoscopic Rou-en-Y gastric bypass (RYGB), 7 patients underwent open RYGB, 9 patients underwent laparoscopic sleeve gastrectomy, and 1 patient underwent jejunoileal bypass. 3 patients who underwent laparoscopic banding were excluded from one of the studies. In one article, 8 patients with unexpected cirrhosis were followed; in the other two, the patients were known to have cirrhosis prior to surgery. There were no intraoperative deaths, but one patient died during the perioperative period from acute hepatic decompensation with hepatorenal syndrome after an ascitic fluid leak. Postoperative complications occurred in 14 patients (32%), including significant blood loss (3 patients), acute tubular necrosis (4), fluid leak (2), and prolonged intubation (2). One article noted that the average estimated blood loss from bariatric surgery in cirrhotics was over twice that of patients without cirrhosis. DISCUSSION: Although bariatric surgery has been shown to improve one’s candidacy for renal transplantation, bariatric surgery in cirrhotics remains an understudied topic. Benefits include improvement in cholesterol and diabetes and, in some patients, histologic improvement of the liver. However, a significant fraction of patients who undergo bariatric surgery have complications compared to noncirrhotic obese patients. There are different surgical approaches, each with their advantages and disadvantages. RYGB is quite effective but makes future endoscopic surveillance difficult. Laparoscopic banding is less invasive and is successful at achieving significant weight loss but is specifically contraindicated in patients with cirrhosis due to a theoretical infection risk. Laparoscopic sleeve gastrectomy is also a less-invasive approach but may pose a significant bleeding risk, especially in patients with gastric varices. It remains unknown whether certain modalities may complicate a future liver transplant. Weaknesses of the experience to date include lack of portal pressure measurements, lack of Model for End Stage Liver Disease (MELD) score calculations, and consistent Child-Pugh score calculation. Additionally, post-transplant outcomes have not been documented. CONCLUSION. 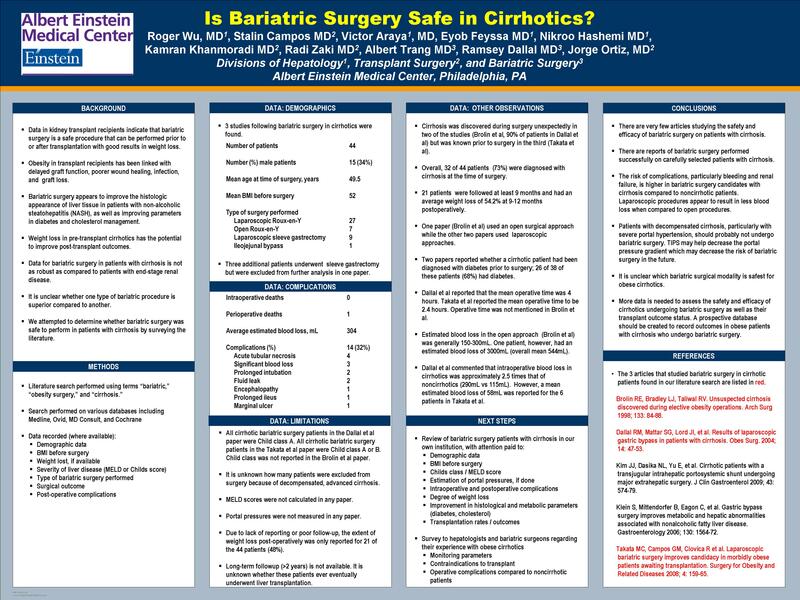 Although there have been reports of safe bariatric surgical procedures in cirrhotics, this remains a largely understudied topic. There is a notable risk of bleeding and infection in these patients compared to patients without cirrhosis. It is not entirely clear which surgical modality is safest in cirrhotics. Randomized trials are needed, and a prospective database should be created to record outcomes of bariatric surgery in cirrhotics.